Sharnell Simmons and Kyle Lightbourne were jailed in the UK following their convictions in a cocaine smuggling plot, according to a story in the Hull Daily Mail. The story said “A cleaner at Hull’s ferry terminal uncovered a cocaine-smuggling plot when she found £24,500 worth of the Class A drug hidden beneath tourism leaflets in the arrivals lounge. “Drugs mule Sharnell Simmons, 41, had arrived at King George Dock on a ferry from Rotterdam on August 28 last year, and had two packages of cocaine glued to the insoles of her shoes, Hull Crown Court heard. “But she panicked while waiting in the arrivals lounge and tried to hide the drugs on a table, while her accomplice, Kyle Lightbourne, 36, who travelled with her, tried to distract staff by talking to them. 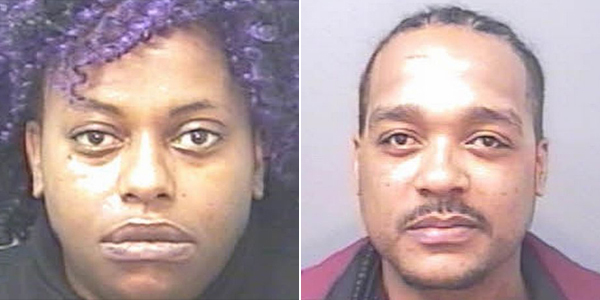 “Although they had family contacts in their native Bermuda, they met in England and Lightbourne had “pressured” Simmons, a former pub singer, into carrying the drugs with the promise of helping her nephew, who had become “embroiled in gang culture in Bermuda”, the court heard. Describing the discovery of the drugs, prosecutor Richard Thompson said: “They arrived in the port of Hull from Rotterdam by ferry. Having proceeded to passport control they were asked to wait while other passengers disembarked so that passport and nationality tests could be completed and their luggage searched. “In the arrivals area, it was apparent, the Crown say, from that point they were likely to be searched, so Miss Simmons set about seeking to dispose of the drugs concealed by the insoles of the shoes she was wearing. “Lightbourne also tried to cover the drugs with leaflets and then spoke to Border Agency staff as a distraction. “The two packages had a combined weight of 307 grams, were of more than 50 per cent purity, and had an estimated street value of £24,500. “Lightbourne, of Ascension Road, Romford, and Simmons, of Cawood Green, Sheffield, both admitted evading the prohibition on the importation of cocaine. “Simmons had no previous convictions. Lightbourne had none in the UK, but had two convictions for possessing cannabis in Bermuda, and one for possessing cocaine with intent to supply. As he was sentenced to the UK equivalent of a community order for the cocaine offence, Judge Mark Bury accepted a defence submission it was for his own use. Lightbourne was jailed for six years, and Simmons for three.